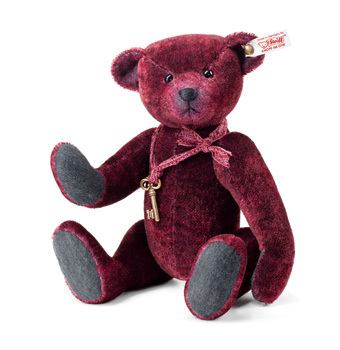 Steiff Basco Teddy Bear Discounts Apply ! Made from The Finest Red Tipped Mohair. The key that hangs around Basco's neck presents a great mystery. Does it open a secret door? Will it unlock a buried treasure chest Only you can discover the truth when you add Basco to your collection. He's next in our series of richly coloured bears (following Nando from 2013). Basco is handmade from a unique red tipped, short-pile mohair. His paw pads are sewn from stippled grey wool felt and our artisans have stitched his nose with matching grey floss. Naturally, he's 5-way jointed. But it is the key that really sets Basco apart. What stories will he tell you? What adventures will he inspire? Will his be the key that unlocks your heart? 5-way jointed with Safety Eyes and stuffed with Safety Filling, and with gold-plated "Button in Ear" with elephant motif and Surface Washable.